Enhance your brand with custom window graphics and lettering for your storefront or office. If you run a business with a storefront retail location or street-level office building, your windows are prime marketing opportunities for your business. They present the opportunity for free advertising of your company name and logo, phone number, hours of operation, and other key details. Custom graphics provide a double branding benefit. First, by prominently displaying your information at eye level, people walking or driving past your location see your brand information. Over time, this exposure to your company makes people more likely to think of your business when they need the types of services or products that you provide. Second, when current customers or clients visit your establishment, they see your beautiful branded graphics. This causes them to develop a stronger impression of the credibility and success of your company. Most companies recognize the value of street-level windows for displaying company information. When deciding how to put their windows to use, hanging printed signage is often the first thing companies consider. While temporary signs may suffice for some business types, any business can elevate the look and feel of its establishment with custom window graphics and lettering. Investing the time and resources needed to design and install custom lettering for your storefront or office signals to current and prospective customers that your company values quality, is successful, and has staying power. This promotes a strong brand image in your community. To create custom designs, premium quality 3M window film is prepared and precision cut according to your specific patterns. Our expert window film installers then apply the custom film patterns to the glass exactly where you want it. This process gives you 100% control over the final appearance of your design. The installation process is fast, clean, and minimally disruptive to your workplace. Once the film is installed, it can be easily cleaned with standard window cleaning supplies. The best part is, your custom window film is built to last. Your investment is protected for years to come under 3M’s manufacturer’s warranty, which is among the most thorough in the industry. What will my custom window graphics look like? Are you curious about what is possible with window film? Take a look at some of the custom graphics we’ve installed for businesses in the Washington DC metro area. 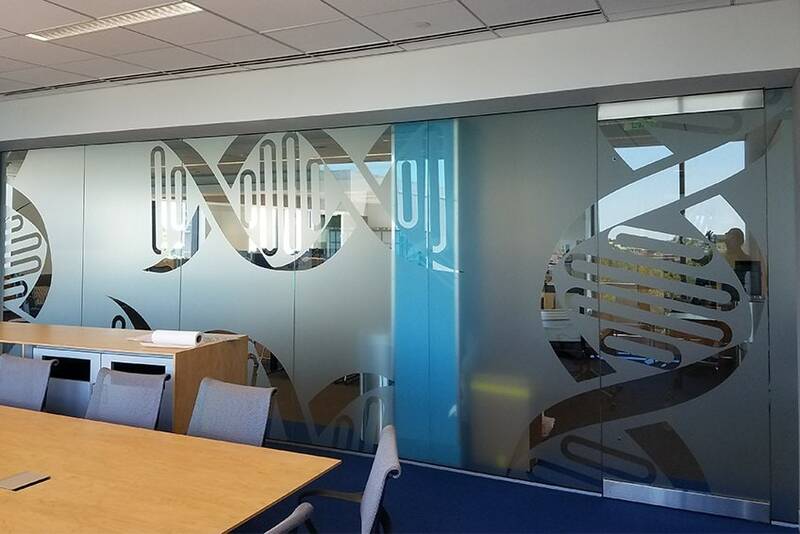 To see more custom decorative window film installations, check out our project gallery. Ready to boost your brand with custom window film? General Solar has been helping businesses like yours for nearly 50 years. To learn more about our custom window film graphics or to schedule an appointment for your free estimate, give us a call at (301) 231-9500. Our window film experts will be happy to assist you. If custom graphics aren’t applicable to your commercial space, learn how our other commercial window film products can benefit your business. General Solar Company has been one of the highest regarded window film companies in the Washington DC metro area for nearly 50 years. In that time, we have built a reputation for professionalism, integrity, and exceptional service. We serve clients in Washington DC, Montgomery County, Rockville and Bethesda, Maryland, and surrounding areas. To schedule an appointment for a free estimate, give us a call today or contact us using this form.